The group hold up in Michigan has disbanded upon the death of their leader John and Albert is captured by King Zombie. King Zombie wishes for him to become his chronicler...something to pass on to posperity. King Zombie must deal with the Demon Lord who is powerless and must continue the search of his mysterious life forces to complete his transformation in this dimension. Dan and Joey come across a motorcycle gang and to their surprise, find out Donna is with them. Bowker is on a rendezvous mission in a city and comes across Reyna, but can she be trusted...this time. All that and more in this first issue to kick off the second volume of Deadworld. 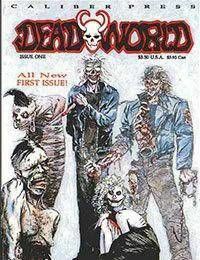 Includes a zombie pin-up gallery drawn by various comic artists.